Written by Tina Plaza-Whoriskey, Senior Communications Manager at ChildTrends for its blog, and re-printed with permission. If demographics are destiny, my family was headed for educational failure. All the signs pointed to struggle. Low-income? Check. Parents without education beyond high school? Check. A primary language other than English? Check. And parents who didn’t read to their children? Check. These are among the factors that contribute to poor academic and life outcomes, according to Make Math Count More for Latino Children, newly published by the Child Trends Hispanic Institute. 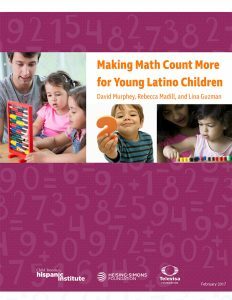 The researchers found that by the time Latino children in this demographic start kindergarten, they trail their white peers in math skills by the equivalent of 3 months of learning. This disparity, if left unaddressed, threatens to increase over time. Taken at face value, these statistics paint an unflattering picture of Latino parents. Why don’t they have books in the home? Why don’t they read to their children? Don’t they care about education? As a Senior Communications Manager at Child Trends, my job is to take these statistics and make them understandable. But since these statistics are so personal, I’d like to provide some context too. Like many immigrant parents, my widowed mother did not choose to keep us out of preschool, and did not think she was neglecting us by not reading to us. She was simply too busy surviving and trying to keep four children fed on a cashier’s salary. In fact, when my oldest sister was offered a full scholarship to Harvard, my mother was willing to let her go, despite the fact that Boston seemed like a foreign land to her. She was letting go of the “second parent” in the home, her right arm, but my mother wanted her to have the best education. Research suggests that Latino parents care deeply about their children’s education, as my mother certainly did. Against all odds, my siblings and I managed to make it out of the projects thanks to family support, government assistance and teachers who believed in us. My immediate family and the second generation that followed are engineers, accountants, law enforcement officials, lawyers and communications professionals. We are the success story. A recent study published in a journal of the American Education Research Association revealed that policies aimed at improving school readiness are beginning to work, although there is still much more to be done. The study reported modest improvements for Latino children in the preparedness gap since the 1990s. Expand access to high-quality early care and education, and make these programs more responsive to the needs of Latino families with young children. Make full-day kindergarten available to all families, regardless of where they live. Adopt guidelines for early math achievement, just as most states have adopted common standards for grades K-12. Latinos currently represent one quarter of all U.S. kindergarteners, and by 2050 Latino children will constitute one third of the entire population under age 5. They are our future, and as the saying goes, a rising tide floats all boats.